Don’t Sign the Vendor Contract Just Yet! Always consider negotiation when implementing a new vendor relationship or renewing an existing one. And, even if you don’t get to be the one wrangling through the negotiations, it’s important that you set the ground rules in conjunction with your vendor risk management program guidelines. 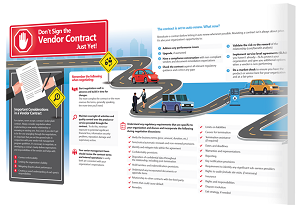 Download our infographic to learn how to develop a contract that clearly defines expectations and responsibilities of the vendor.